located at Dubai Healthcare City an urban healthcare landmark for corporations and individuals, over one of Dubai’s vital roads, al Khail road, which interconnects residential and commercial districts from south to north in the city, DHCC area offers the solution of an integral healthcare district supported in a variety of uses from commerce, top of the range hotel communities, residential and services. DHCC and its continues development and prime location, in addition to its surroundings and easy access to the city main destines has become popular for hotel development and district development. THE PROJECT : A contemporary design. 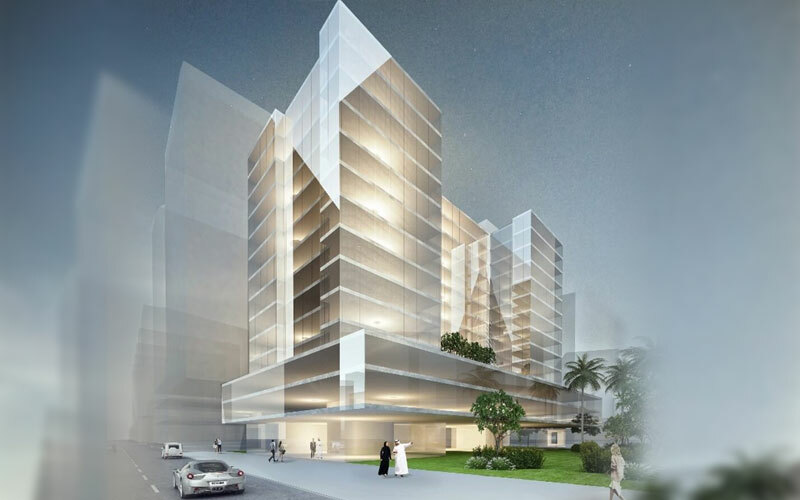 DHCC Residential offers the end user, style and comfort on an optimize space designed to accommodate the needs of the dynamic and variated resident profile of Dubai Emirate. DHCC Residential comprises studios, one and two-bedroom apartments. Interiors are and serene, with a contemporary and chic feel. Designed to accommodate, demanding lifestyles of modern individuals and families, DHCC Residential offers amenities for fitness and recreation. Residents will enjoy spaces thought to be used and enjoy, such as the gym, pool and lounge areas, indoor and outdoor solution to leave the city behind without being away from it. A sophisticated urban lifestyle that are affordable & usable, DHCC Residential is a perfect fusion of contemporary design and practical living.